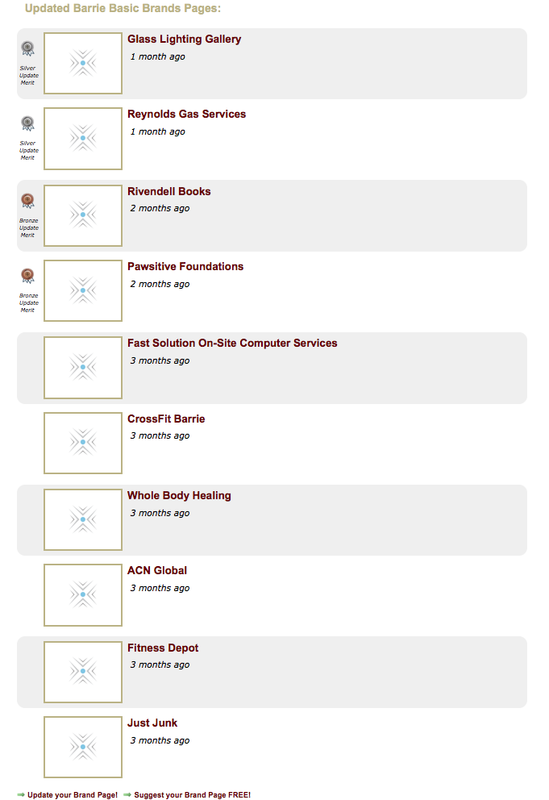 Organizations who have recently updated their Specialties Pages are now listed together on one page. The recently updated pages are organized in two ways. First, they are separated by Enhanced and Basic Specialties Pages. Recently updated Enhanced Specialties Pages come first, followed by the recently updated Basic Specialties Pages. The recently updated Specialties Pages are then broken down by the date and time of the last update. The most recent updates are found at the top of the category. However, Enhanced Specialties Pages always come first, no matter how recently updated the Basic Specialties Pages are. 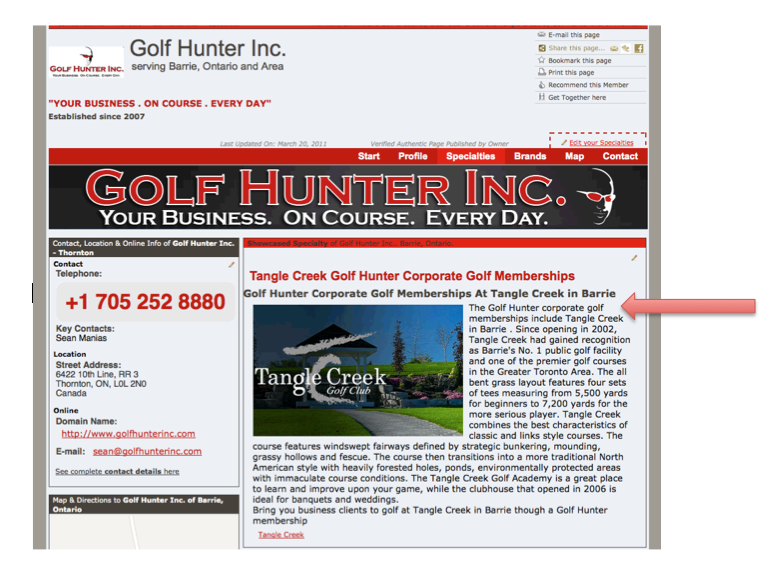 Golf Hunter Inc. would come before The Flower Place.ca because it is in the Enhanced Specialties Page category. Headline and subhead: The first Headline and first Subheading from the Specialties Page are pulled into this list to provide more information about the organization. This also creates consistency between pages. There is a maximum of 20 organizations in the list for recently updated Specialties Pages: 10 Enhanced Specialties Pages, and 10 Basic Specialties Pages. 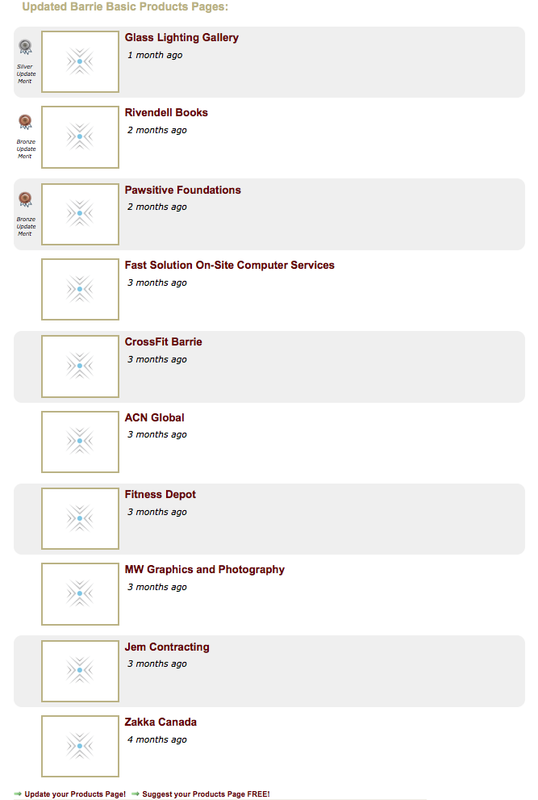 Organizations can get their names on this list simply by updating their Specialties Page. 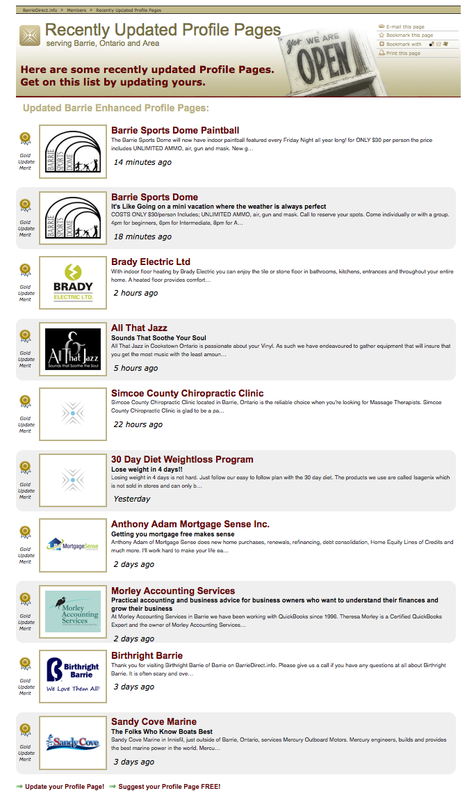 The more your Specialties Page is updated, the more your name can be featured on this list! 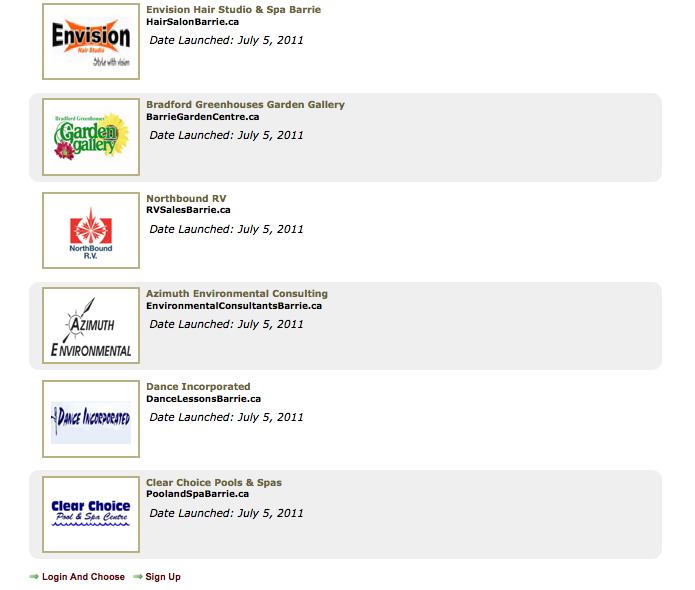 Organizations who have recently updated their Profile Pages are now listed together on one page. The recently updated pages are organized in two ways. 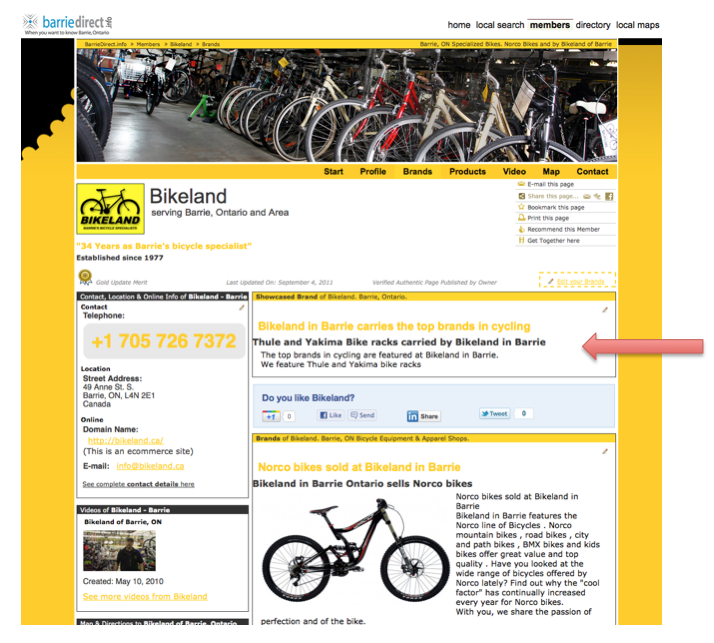 First, they are separated by Enhanced and Basic Profile Pages. Recently updated Enhanced Profile Pages come first, followed by the recently updated Basic Profile Pages. The recently updated Profile Pages are then broken down by the date and time of the last update. The most recent updates are found at the top of the category. However, Enhanced Profile Pages always come first, no matter how recently updated the Basic Profile Pages are. Anthony Adam Mortgage Sense Inc. would come before Barrie Condo Team because it is in the Enhanced Profile Page category. Headline and subhead: The first Headline and first Subheading from the Profile Page are pulled into this list to provide more information about the organization. This also creates consistency between pages. Logo and name: The organization name and logo are shown in the Recently Updated Profile Page list for easy recognition. There is a maximum of 20 organizations in the list for recently updated Profile Pages: 10 Enhanced Profile Pages, and 10 Basic Profile Pages. Organizations can get their names on this list simply by updating their Profile Page. The more your Profile Page is updated, the more your name can be featured on this list! 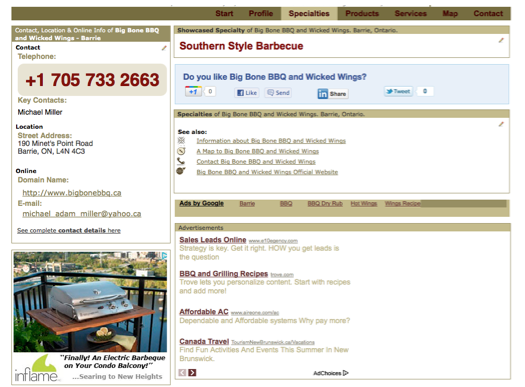 This page displays the organization name, company logo or image, date launched and a link to the website. This list contains 20 of the most recently launched websites. Launch your website and get on this list! 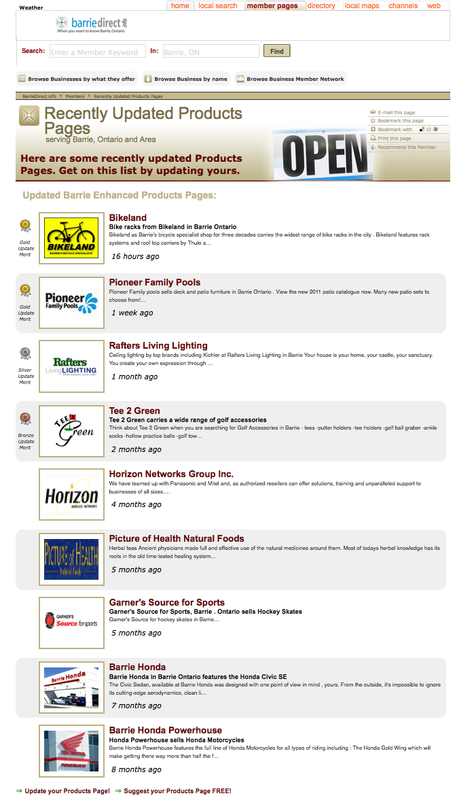 Organizations who have recently updated their Products Pages are now listed together on one page. The recently updated pages are organized in two ways. 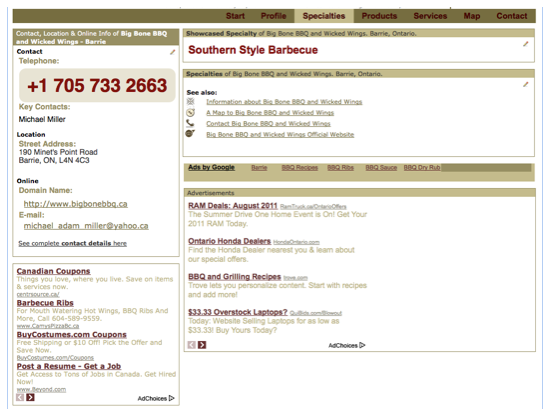 First, they are separated by Enhanced and Basic Products Pages. 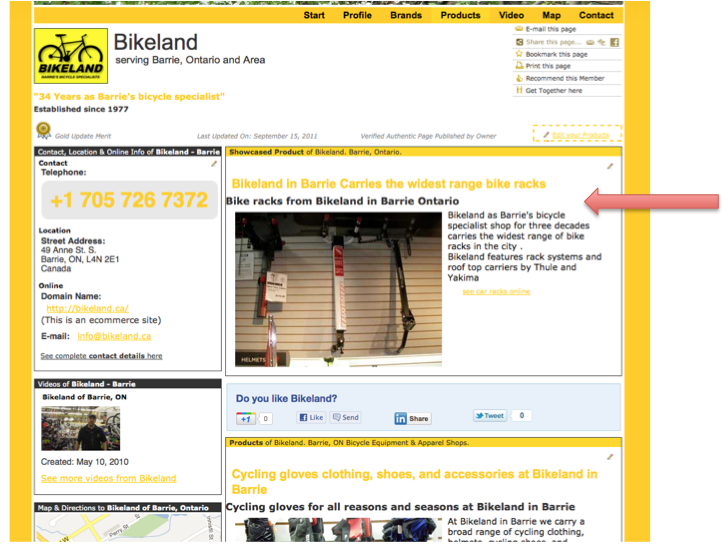 Recently updated Enhanced Products Pages come first, followed by the recently updated Basic Products Pages. The recently updated Products Pages are then broken down by the date and time of the last update. The most recent updates are found at the top of the category. 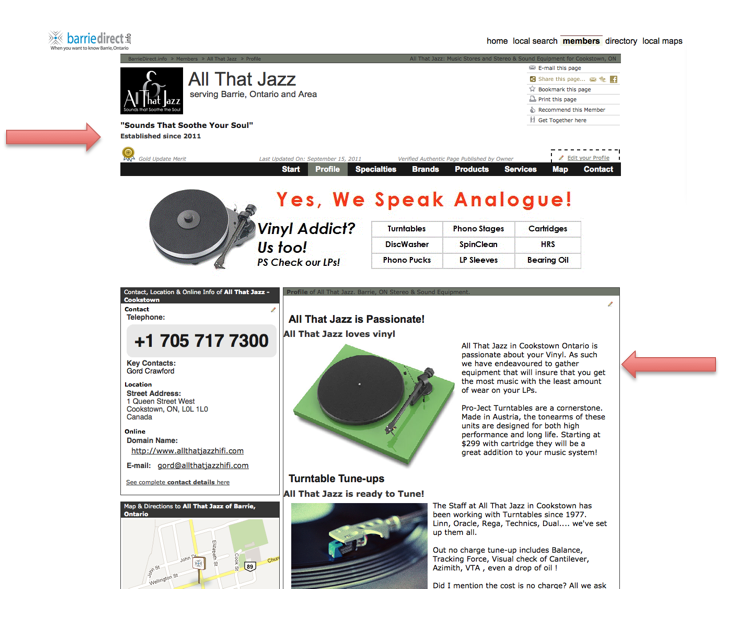 However, Enhanced Products Pages always come first, no matter how recently updated the Basic Products Pages are. Tee 2 Green would come before Glass Lighting Gallery because it is in the Enhanced Products Page category. Headline and subhead: The first Headline and first Subheading from the Start Page are pulled into this list to provide more information about the organization. This also creates consistency between pages. Logo and name: The organization name and logo are shown in the Recently Updated Products Page list for easy recognition. There is a maximum of 20 organizations in the list for recently updated Products Pages: 10 Enhanced Products Pages, and 10 Basic Products Pages. 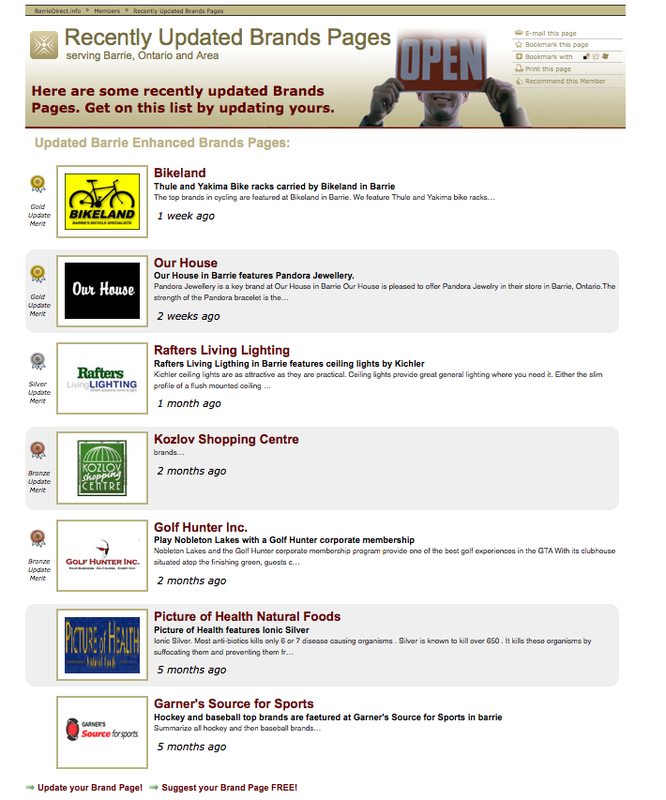 Organizations can get their names on this list simply by updating their Products Page. 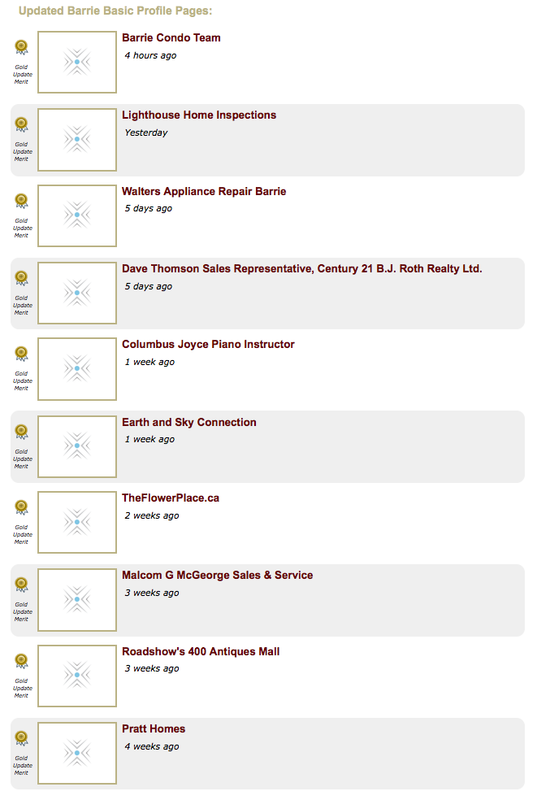 The more your Products Page is updated, the more your name can be featured on this list! Headlines are now available on Basic Listings! Previously, headlines were only available on Enhanced Listings and were followed by a small summary about the organization. Now, Basic Listings have headlines as well! Placing headlines on the Basic Listings controlled by Business Members is another way in which we can differentiate Business Members from Prospects. The headlines also provide another way for you to get updated, fresh content on your Listings.